CarGurus has 22,098 nationwide Camaro listings starting at $3,995. Four years ago, Chevrolet reintroduced the Camaro with a modern look and a V6 engine worthy of muscle cars to go along with the V8 choices that could melt rubber. And there's another major reintroduction this year—the track-ready Z/28 trim has returned as part of the 2014 Chevrolet Camaro lineup. There was no backslash in the name when the first Z28 came out in 1967, hitting the track as part of the Trans-Am racing series, and the last reincarnation of this speed demon was seen in 2001. The new Z/28 uses the same engine as the Corvette Z06, a naturally aspirated, 7-liter V8 that churns out 500 hp and 470 lb-ft of torque. All that power is pushed to the rear wheels by a 6-speed manual transmission. To get the most out of that engine, Chevrolet made sure the Z/28 was lighter than last year's top-end performance model, the ZL1, and more aerodynamic. The Z/28 cut weight with Brembo carbon-ceramic brakes, lighter wheels, less sound-deadening material, an uncarpeted trunk, no power seats and by making air-conditioning and a stereo optional. The aerodynamic changes include side fender flares, extended rocker panels, a rear spoiler, an oversized front splitter and an underbody panel. To further increase performance and that track feel, the Z/28 also comes with sticky Pirelli Trofeo tires, a dry-sump oil system, transmission and differential coolers, a flat-bottomed steering wheel and Recaro sport seats with a 5-point harness instead of a seatbelt. While the addition of the Z/28 will grab most of the headlines for the 2014 Camaro, it isn't the only significant change, as both the front and rear fascias get noteworthy makeovers. The upper portion of the front grille has been compressed and is more angular, and the lower portion has been widened to allow for more cooling air intake, which is expelled through the new hood vent on SS trims. All the lighting on the Camaro Coupes and Convertibles has been streamlined, most notably in the rear with solid rectangular taillights. The decklid and diffuser have also been tweaked to improve aerodynamics. There are only two interior additions for the 2014 Camaro—those Recaro sport seats are also available in other models, as is a full-color heads-up display. But just last year Chevrolet upgraded the interior materials for the Camaro and added the MyLink touchscreen audio system with an available GPS navigation system. Not to mention the high-performance 1LE option package that came out in 2013 (unique gearing, tires and suspension tuning), as well as the upgraded dampers, anti-roll bars for V8 models and the standard hill-start assist for manual-transmission versions that were all introduced last year. Three engine choices from 2013 carry over into this year. There's a 3.6-liter V6 (323 hp, 278 lb-ft of torque, 17 mpg city/28 highway) that comes standard in the Coupe and Convertible 1LS, 2LS, 1LT and 2LT trims. The 6.2-liter V8 (426 hp, 410 lb-feet of torque, 16/24) comes with the Coupe and Convertible 1SS and 2SS trims. And the supercharged 6.2-liter V8 (580 hp, 556 lb-ft of torque, 14/19 mpg) that goes with the Coupe and Convertible ZL1 trims. The Camaro also received perfect 5-out-of-5 scores in 2013 from the National Highway Traffic and Safety Administration in its front, side and rollover crash tests. Those marks, as well as a 5-star overall safety score, should carry over into this year. Notable safety features include front, side and rear head airbags, full side airbags, electronic stability control, traction control and 4-wheel antilock disc brakes. 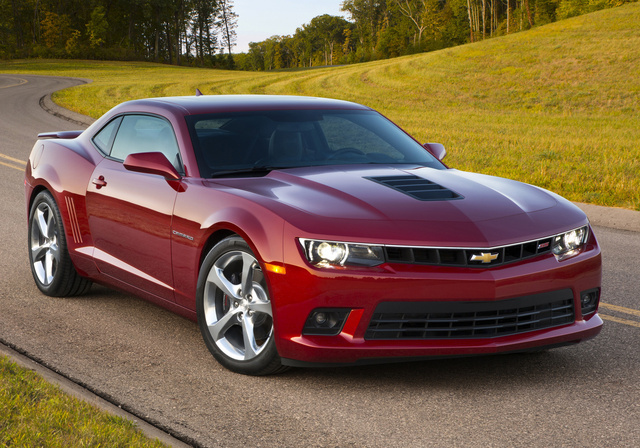 What's your take on the 2014 Chevrolet Camaro? Users ranked 2014 Chevrolet Camaro against other cars which they drove/owned. Each ranking was based on 9 categories. Here is the summary of top rankings. Have you driven a 2014 Chevrolet Camaro? My carfax report is reading my title as branded. I went to the DMV to get it fix but not sure how I get it off my carfax report. 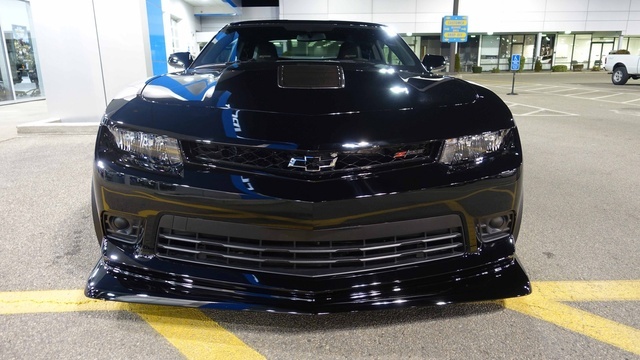 What Is The Best Place To Look For Front Bumper Spoiler For 2014 Camaro?